For many of us, easy to prepare, tasty little meals out of a can or box are at least a small part of our childhood memories; they were first attempts at “cooking”, in a way! 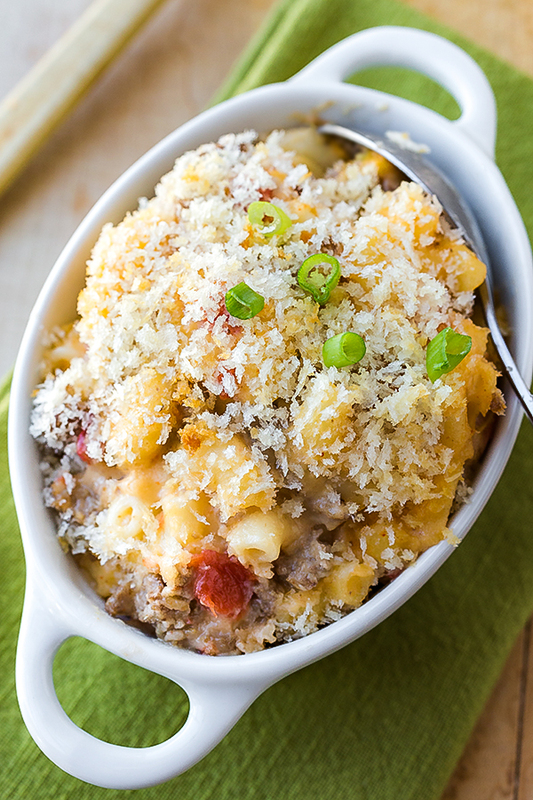 And with this Cheeseburger Macaroni and Cheese, we can enjoy the coziness of childhood comfort food, only in a slightly more sophisticated and from-scratch way. Nothing felt more safe and comforting to me when I was a kid than unlocking the front door of our house and stepping into that cozy and familiar world that I could completely relax and be myself in, that brilliant world of “home”, after walking home from a long day at school. All of the little stresses of my day would begin to melt away, those little dramas that took place during elementary school and middle school on the playground, or in the hallways, or between friends that could be so very fickle (and mean!) at times. Once I walked in through that front doorway, I would drop my backpack and put away my jacket or coat and head straight into the living room where my first order of business was to flip on those cheerful and innocent afternoon cartoons that I loved so much. Ah…to be home was wonderful! I grew up in a household where my mom always had home-cooked food on the table for us; but when I was a kid, sometimes those little meals-out-of-a-can or box would taste so good, and make me feel like I was actually cooking something of my own choosing, for myself, as I unwound a little from my day out in that crazy world. Oh, how I love and cherish those delicious little memories! And I still love the comforting and cozy aspects of those particular little meals, though nowadays, I appreciate it when they’re from scratch with whole and healthy ingredients, slightly more refined, and a bit more complex on the palette. 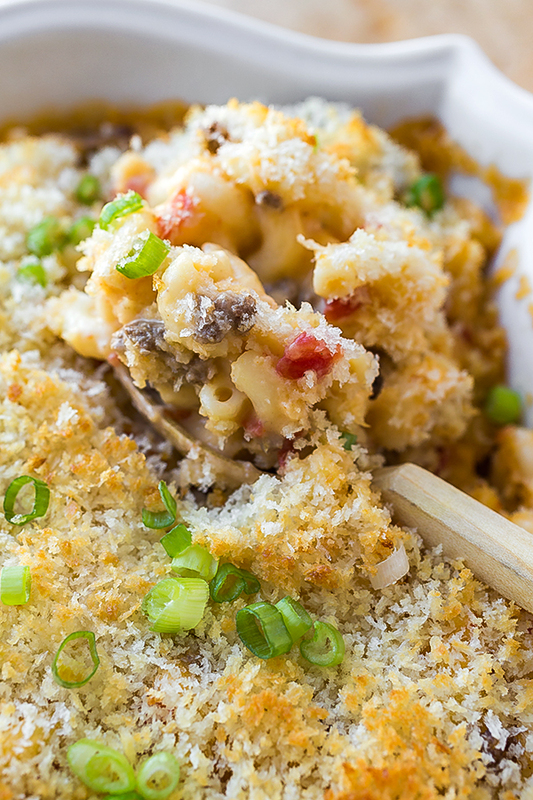 The fall is a wonderful time to dig a big spoon into a hearty, warming, rich, and flavorful macaroni and cheese; it is the perfect time to enjoy those delectable aspects of a nourishing bowl of homemade comfort food. And the glorious thing is, you don’t even have to be a kid to appreciate tucking into something like that! Whatever age we are, we can enjoy and luxuriate in a little TLC in the way of a steaming, nurturing meal, one that goes down ever so easily and exquisitely. So in honor of those “good ol’ days” of coming home from elementary school, way back when (the 80’s!! 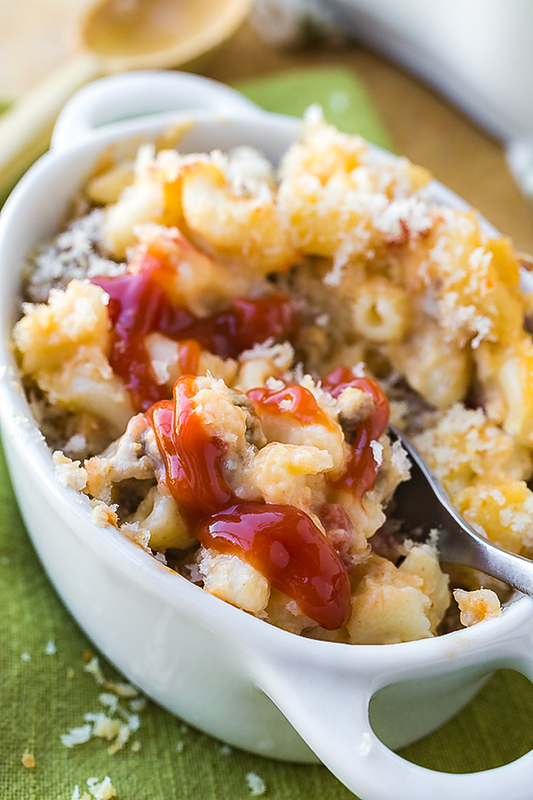 ), and opening up a tasty little treasure that would keep me company and warm me to my very core, this simple, homemade Cheeseburger Macaroni and Cheese, all savory, tender, and cheesy-tomatoey, seems to be just the ticket! 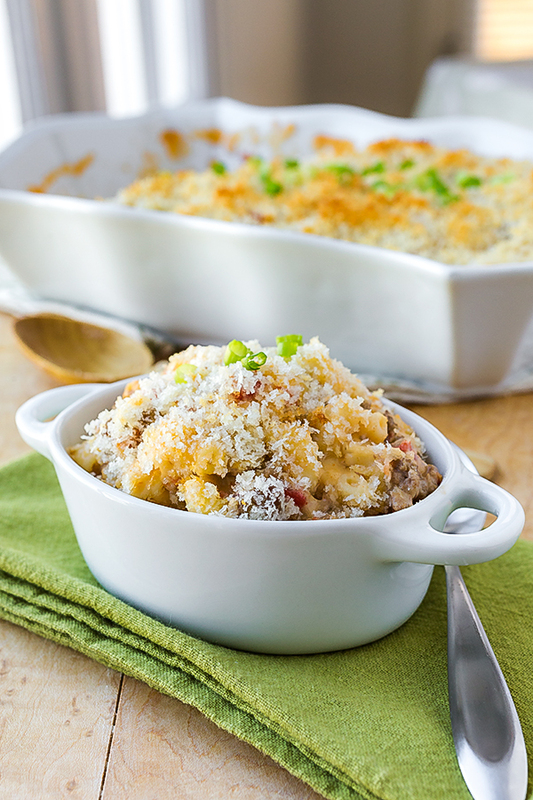 -Preheat oven to 400°, and lightly mist a baking dish or casserole dish with a touch of cooking spray. -Place a large saute pan or skillet over medium-high heat, and once hot, crumble in the ground beef, plus a little pinch of salt and pepper, and cook until no longer pink; drain the meat completely of juices and fat, and set aside for a moment. -Into a medium or medium large pot set over medium-low heat, add the 1 ½ ounces of butter along with the garlic; once melted and aromatic, sprinkle in the flour and stir, and cook this roux, or thickener, for about 1-2 minutes; pour in the milk, whisking all the while to avoid lumps from forming, and allow the sauce to simmer for about 8-10 or so, or until gently bubbling and thickened; turn off the heat. 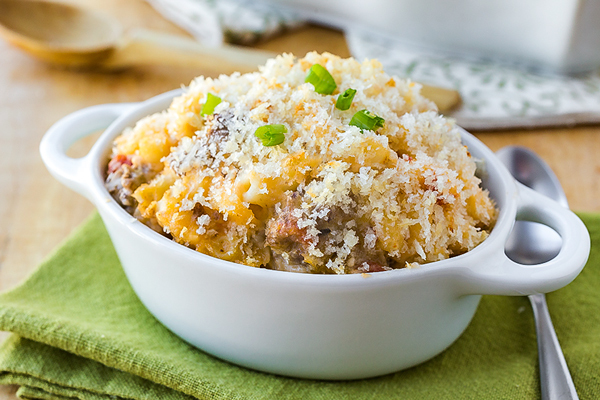 -Add in the grated cheddar cheese, and whisk until melted into the sauce; next add in the ground mustard, the salt, the paprika, and the black pepper, and whisk to combine; add in the drained and cooked ground beef, and stir. -Next, add in the cooked macaroni, along with the drained diced tomatoes, and gently fold everything together until well combined; check the seasoning to see if any additional salt/pepper is needed. -In a small bowl, combine the panko with the melted butter, and using a fork, toss together. 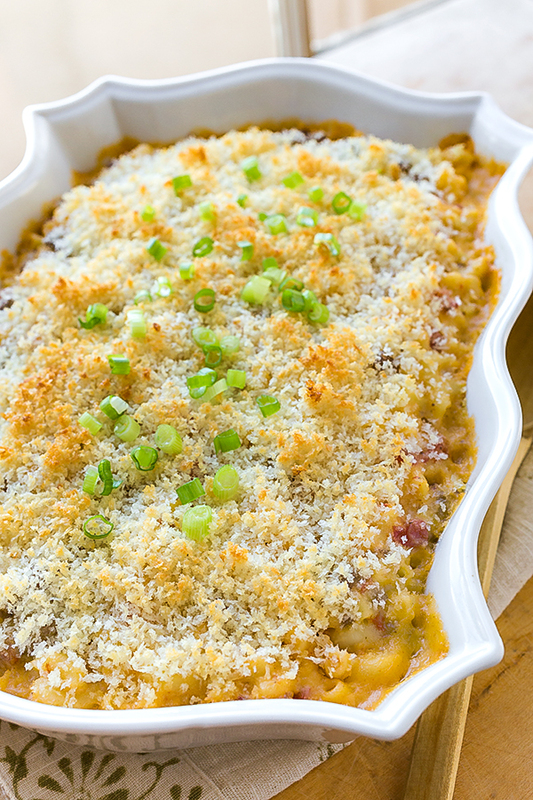 -Pour the macaroni ingredients into the prepared baking/casserole dish, and sprinkle the panko/butter mixture over top; bake for about 15-20 minutes, and if you’d like a darker crust, turn the broiler on at the end for a minute or two to crisp the crumbs. 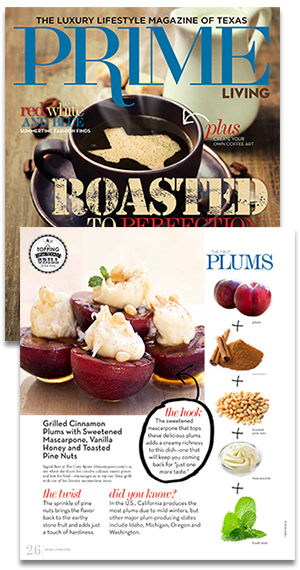 And not just about the mouth-watering, lip-smackingly delicious recipes, but you too. When I read about you, I wished we could be friends. You seem like such a warm, loving person. How you’ve described your childhood along with the love and passion for food is beautiful. You’ve rightly named your blog. I’m so inspired and impressed. Definitely will be trying your recipes. Sahar, you are so very kind! Thank you for your sweet comments. 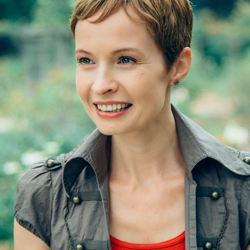 I am so glad to have you come by the blog, and I hope that you will continue to find the posts inspiring, and the recipes worthy of trying out and enjoying! Again, thank you for taking the time to come and share your sentiments with me; they are very much appreciated! This is such a great recipe and so easy. Ive made it countless times and it’s so perfect. Thank you for taking the time to share this! Hi Kayleigh, I love that! Thanks for letting me know! Glad you’re enjoying this, and that you find is simple to prepare. 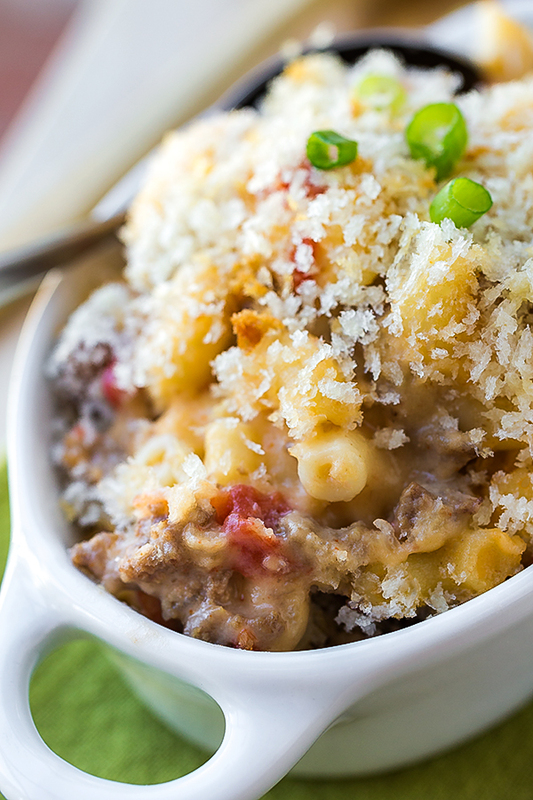 Nothing quite like homemade comfort food, right? Thanks for commenting! The dish was delicious! We added some diced onions and mushrooms as well as fresh grape tomatoes to the mix which we sauteed just before putting everything into the final baking pan. I think it added a lot and helped balance out the texture of the meal! Glad you enjoyed, David! Thanks for sharing your experience. This is a great recipe. I made it in my instant pot for my son-in-law who is undergoing chemo and needs to eat carbs. I changed the mustard to Spicey brown mustard because I couldn’t find my dry mustard. Additionally, I did not drain the tomatoes as I added the tomato juice to that of the beef broth that I used to cover the noodles. I cooked it for 9 minutes and did a quick release. Any ideas the calorie count for the receipe? Hi Bev, I am so sorry to hear about your son-in-law who is undergoing chemo; I send your entire family my hopes for healing and speedy recovery, strength and peace. I am thrilled to read that this recipe is one that you’ve prepared for him, and that you found a convenient way to do it. As far as the calories, I just plugged the ingredients into a counter we are now using (we haven’t yet updated this recipe), and it has 648 calories when you get 6 servings out of it, or 972 if you get 4 servings. Hope that helps, Bev! Hi Pamela, you can make this ahead of time, but I would probably keep the components separate until I’m ready to bake it off; then, I would combine the sauce with the macaroni and everything else, and proceed with baking. Okay this is going to sound crazy…but I added cut up pickles to this and it was AMAZING. Thanks for sharing your recipe! Actually Miranda, that sounds super creative and yummy! Kudos for that addition, and thanks so much for sharing your experience!